Introduction: Crizotinib was approved to treat anaplastic lymphoma kinase (ALK)- positive non-small cell lung cancer (NSCLC) by the Food and Drug Administration in 2011.We conducted a systematic review of clinical trials and retrospective studies to compare the efficacy and safety of crizotinib with chemotherapy. Methods: We searched electronic databases from inception to Dec. 2016. Clinical trials and retrospective studies regarding crizotinib and crizotinib versus chemotherapy in treatment of NSCLC were eligible. The primary outcomes were the objective response rate (ORR) and disease control rate (DCR). Results: Nine studies (five clinical trials and four retrospective studies) including 729 patients met the inclusion criteria. Crizotinib treatment revealed 1-year OS of 77.1% and PFS of 9.17 months. And crizotinib had a better performance than chemotherapy in ORR (OR: 4.97, 95%CI: 3.16 to 7.83, P<0.00001, I2=35%). DCR revealed superiority with crizotinib than chemotherapy (OR: 3.42, 95% CI: 2.33 to 5.01, P<0.00001, I2=0%). PR (partial response) were significant superior to that of chemotherapy through direct systematic review. No statistically significant difference in CR (complete response) was found between crizotinib-treated group and chemotherapy-treated group. Regarding SD (stable disease), chemotherapy-treated group had a better performance than crizotinib-treated group. Common adverse events associated with crizotinib were visual disorder, gastrointestinal side effects, and elevated liver aminotransferase levels, whereas common adverse events with chemotherapy were fatigue, nausea, and hematologic toxicity. Conclusion: This systematic review revealed improved objective response rate and increased disease control rate in crizotinib group comparing with chemotherapy group. Crizotinib treatment would be a favorable treatment option for patients with ALK-positive NSCLC. ALK inhibitors may have future potential applications in other cancers driven by ALK or c-MET gene mutations. 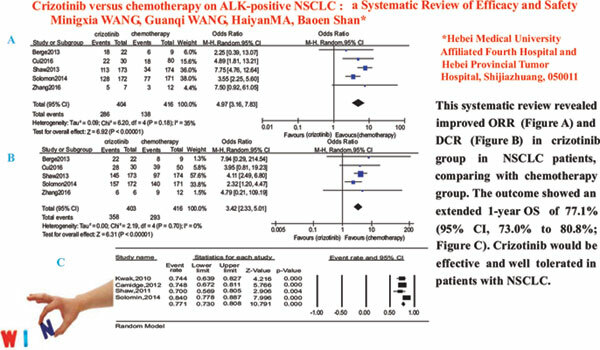 Systematic review, Crizotinib, chemotherapy, Anaplastic lymphoma kinase (ALK), Non-small cell lung cancer (NSCLC).